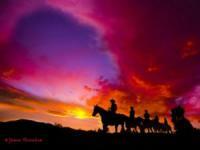 Horseback rides, cattle round ups, raft trips & more Western adventures. Triple G. Outfitters has been in operation since 1991 and is located on the 4 Eagle Ranch, in Wolcott, Colorado. Guides pride themselves on their professional experience and level of safety. Each horseback ride starts with an informational safety and demonstration talk to help riders feel comfortable while on a ride. The unique ranch setting offers breathtaking views of the Sawatch Range, Castle Peak and Red and White Mountain. All of this located just 23 miles from Vail and 16 miles from Beaver Creek. Vacation Horseback Rides for Horse Lovers!